Type 293 air / surface search ? Type 279 / 281 air warning ? Note: Radar fit is extrapolated from photos. 3 6 Pdr. saluting guns. 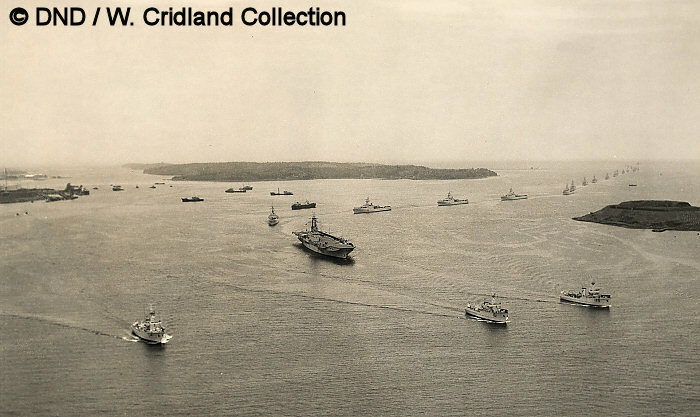 24/1/1946 Returned to RN Service. Became Argentine INDEPENDENCIA in 1958. 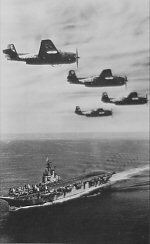 7/4/1948 Returned to RN and placed in reserve. 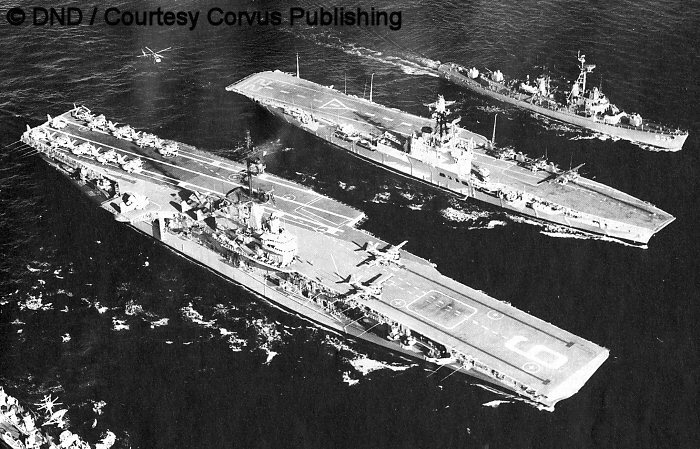 All three ships were Royal Navy type Light Fleet Carriers, of the similar COLOSSUS and MAJESTIC classes. HMCS WARRIOR served in the RCN from 1946 to 1948 while on loan from the Royal Navy. When it was determined that she was not suited for conditions on the North Atlantic, she was transferred to the West Coast and served her remaining time with the RCN there. 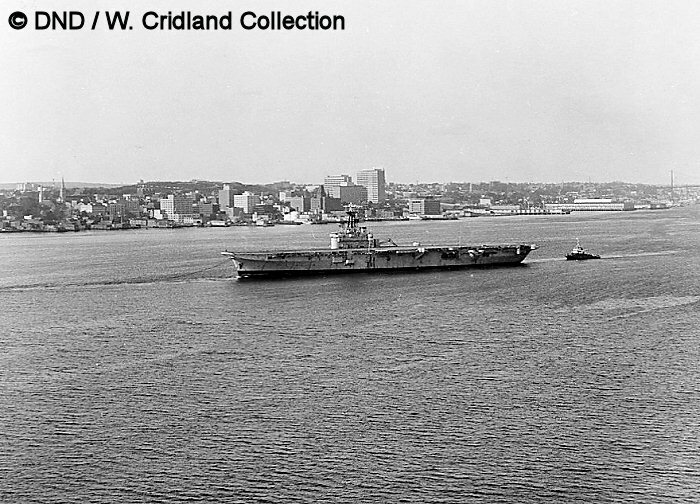 In 1948, she was exchanged back to the RN for a slightly larger carrier, HMCS MAGNIFICENT. 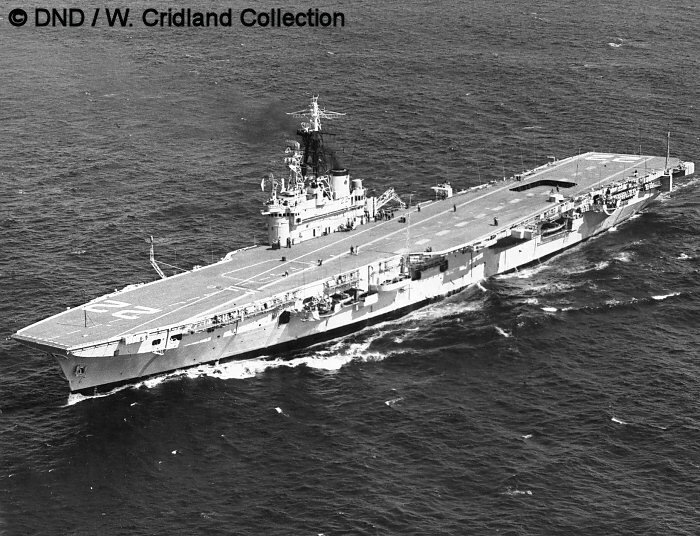 After leaving the RCN, she was returned to the RN and altered to include an angled flight deck. 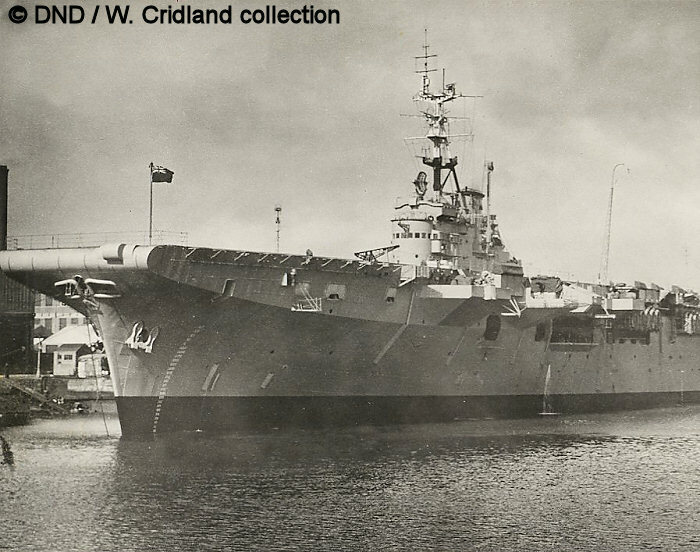 She served with the RN until 1958, at which point she was transferred to Argentina and renamed INDEPENDENCIA. 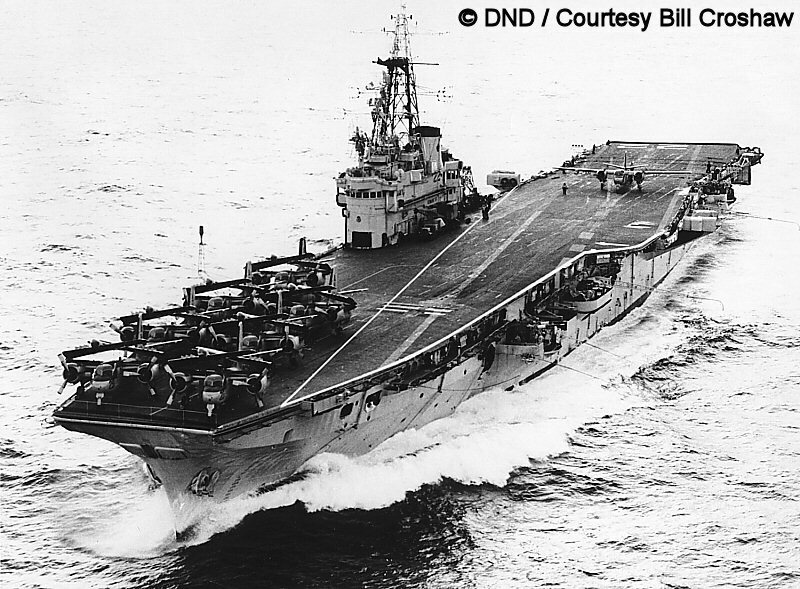 HMCS MAGNIFICENT (" Maggie") replaced WARRIOR and was borrowed from the Royal Navy between the years of 1948 and 1957. During this time, 'Maggie' participated in endless training exercises. During the Crisis in the Middle East in 1956, she arrived in Port Said with a deck load of vehicles and army personnel as Canada's contribution to the UN force there. After returning to the RN, she was laid up for several years and then scrapped in Faslane, Scotland. 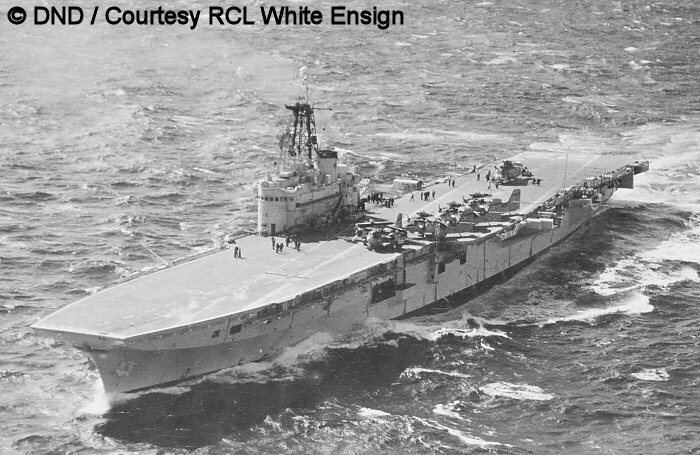 BONAVENTURE ("Bonnie") was the last aircraft carrier to serve in the RCN. Construction was stopped in 1946 when the war ended, but began anew in 1952. 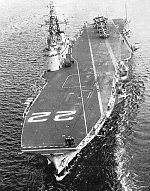 At this late date, certain improvements had been developed and were incorporated, such as an angled landing deck and a mirror landing system. Originally to be named HMS POWERFUL, the RCN renamed her after a bird sanctuary in the Gulf of St. Lawrence. She was purchased outright, unlike her predecessors, and served until 1970. 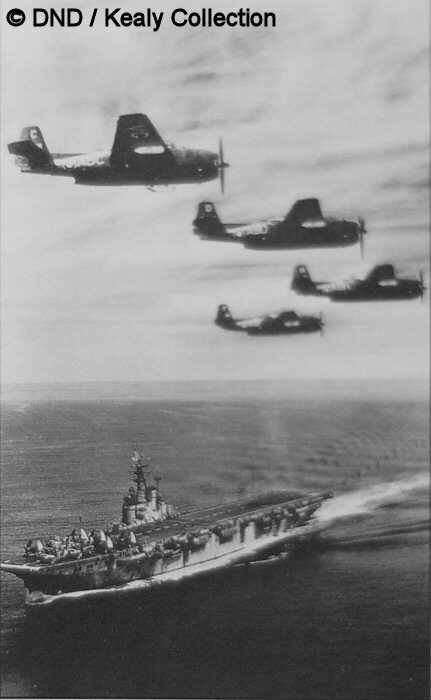 Prior to her role change in 1961 to that of an ASW carrier, she carried a mixed airwing of fighters and ASW aircraft. After 1961, the Banshee fighters were deleted and she carried only Trackers, Sea Kings, and H04S plane guard aircraft for the rest of her career. 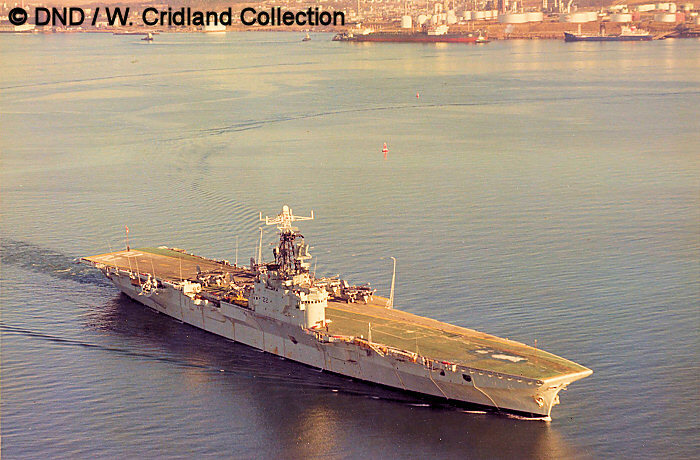 During 1967-68, she underwent an extensive refit to see her through the latter half of her service life; however, she was paid off just two years later and sold for scrap. 1. HMCS WARRIOR shortly after handover to the RCN. (04/46) MOD (UK) photo. 2. A sequence showing the aftermath of a Fairey Firefly crash on WARRIOR. Ralph Fisher photo. 3. WARRIOR preparing to launch aircraft. (1946) DND photo / D. Kealy Collection, Courtesy Corvus Publishing Group. 1. MAGNIFICENT, probably at the time of the Suez Crisis, with peacekeepers and RCAF Otters embarked. UK MOD photo. 2. MAGNIFICENT alongside. DND photo / W. Cridland collection, Courtesy of Bonnie McIssac. 3. Maggie on her return to the Royal Navy, laid up prior to scrapping. M.D. Thomas photo. 4. Maggie with several Fireflies on her foredeck. (03/50) USN photo. 5. DND photo / D. Kealy Collection, Courtesy Corvus Publishing Group. 1. Bonnie at sea. 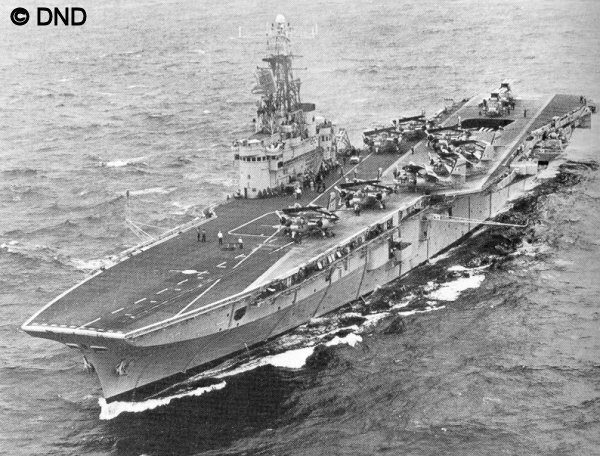 Her deck is clear of aircraft, and the aft elevator is partly depressed. 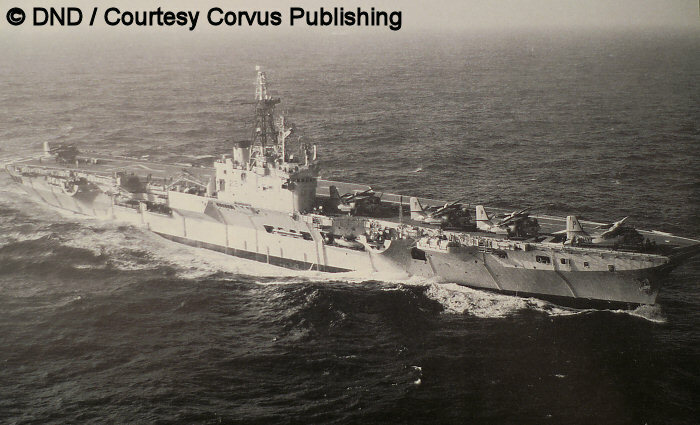 This photo shows her appearance prior to her 1967 refit. DND photo / W. Cridland collection, Courtesy of Bonnie McIssac. 2. Bonnie after her 1967 refit, with Trackers embarked. DND photo / W. Cridland collection, Courtesy of Bonnie McIssac. 3. Bonnie passes Georges Island in Halifax Harbour, at the head of the East Coast fleet. 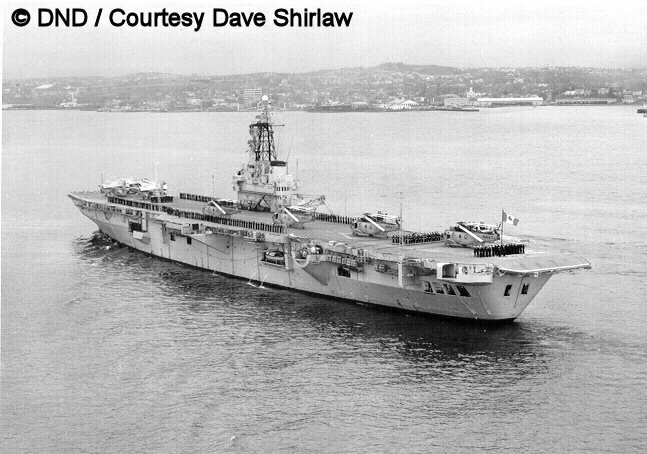 This photo probably dates to about 1960, and was definately taken prior to her 1967 refit. DND photo / W. Cridland collection, Courtesy of Bonnie McIssac. 4. Bonnie departs Halifax Harbour for the last time, under tow to the scrapyard. DND photo / W. Cridland collection, Courtesy of Bonnie McIssac. 5. 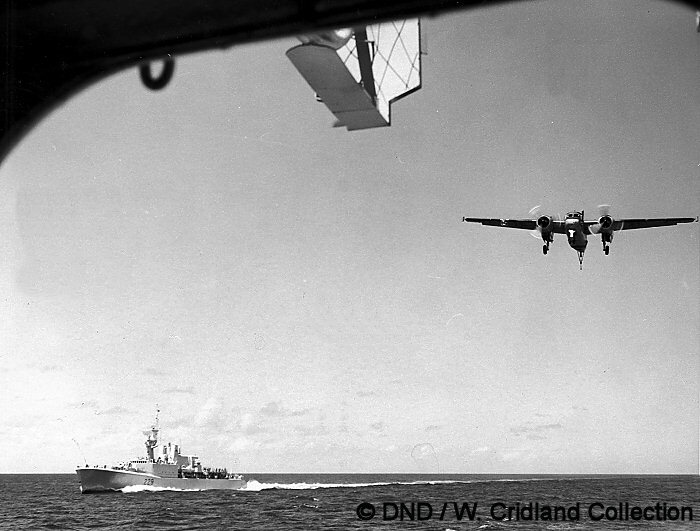 A Tracker on landing approach to Bonnie, with HMCS OTTAWA in the background. DND photo / W. Cridland collection, Courtesy of Bonnie McIssac. 6. Bonnie and USS ESSEX participate in an ASW exercise. Both carriers have Trackers ready to launch. DND photo / Courtesy Corvus Publishing Group. 7. A post-refit Bonnie at sea, with Trackers and a Sea King on deck. DND photo / Courtesy RCL White Ensign. 8. Bonnie departs the wharf at Shearwater, probably after her 1967 refit. DND photo / Robert St-Pierre collection. 9. DND photo / Robert St-Pierre collection. 10. 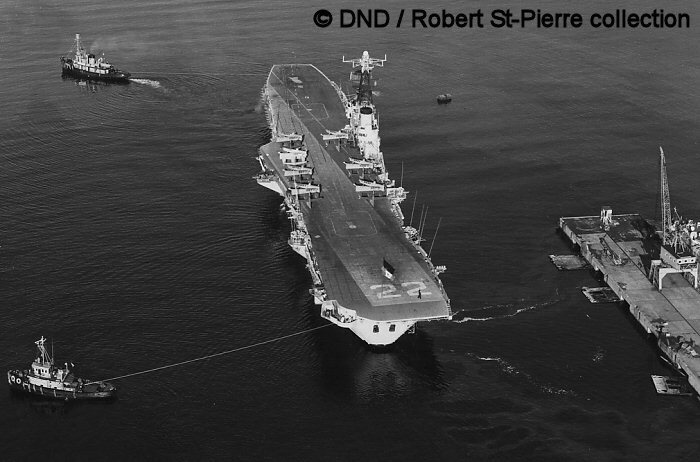 HMCS BONAVENTURE, fresh from her 1967-68 refit. Note the presence of the Sea Kings at the stern, and the absence of Banshees or the forward 3"/50 guns and their sponsons. 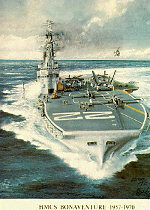 ('68) DND photo. 11. 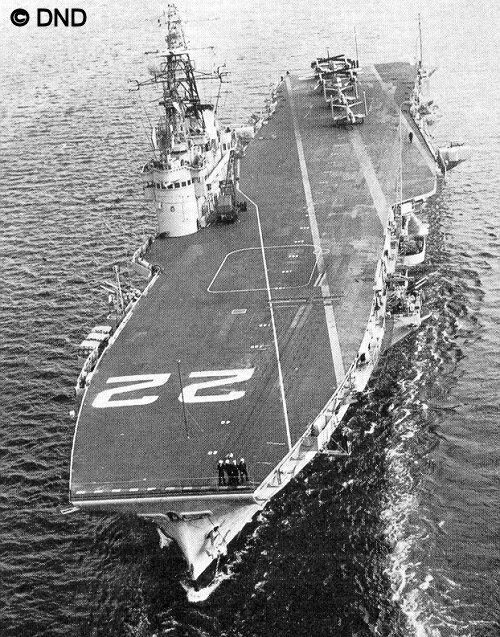 BONAVENTURE after her 1961 role change to ASW carrier, but before her 1967 refit.. 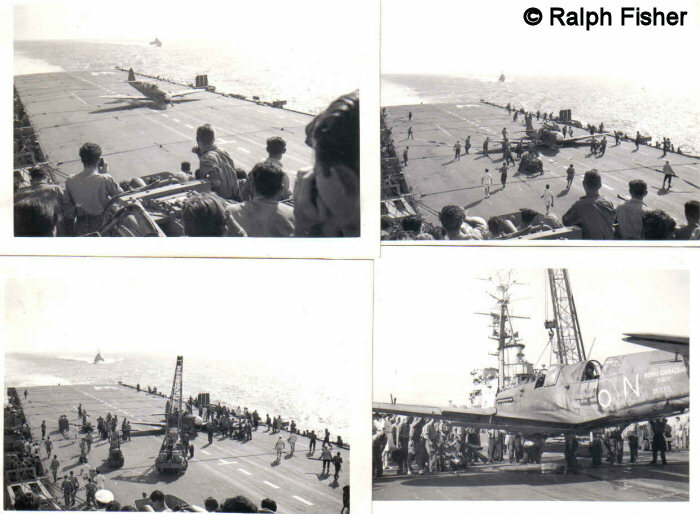 The aircraft on deck are all Trackers; note the forward 3"/50 is present in this photo as opposed to the previous photo. The Sea Kings had not yet entered the fleet at this point in time. DND photo, Courtesy of Bill Croshaw. 12. 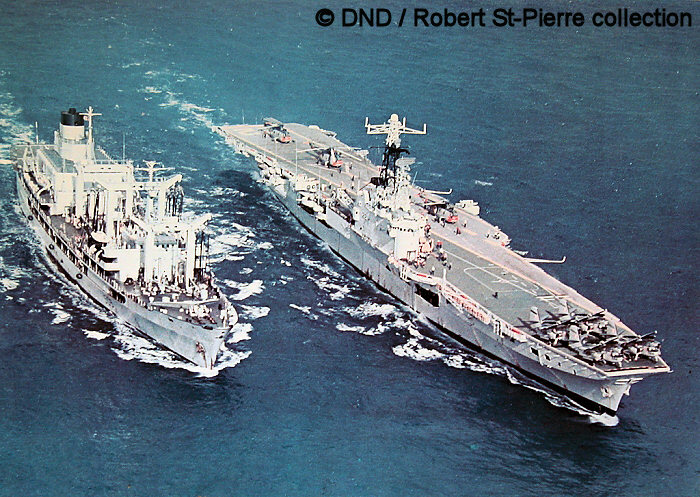 BONAVENTURE with a deck load of Sea Kings and Trackers, after her 1967 refit. DND photo, Courtesy of Dave Shirlaw. 13. A painting of BONAVENTURE during the early period when she carried Banshees. 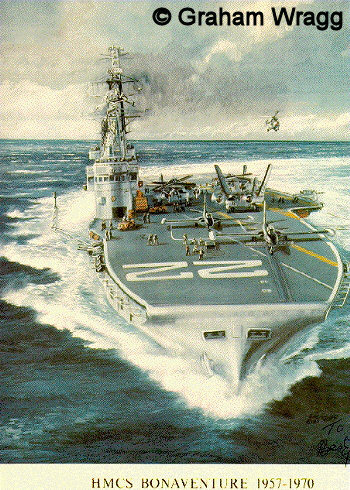 The starboard 3"/50 forward gun is visible just ahead of the bridge, and a Sikorsky H04-S is flying off the port side as a plane guard. Painting by Graham Wragg. 14. A photo of BONAVENTURE taken during the same period as the painting above. Again, note the appearance of Banshees and the forward 3"/50 guns and the associated sponsons. DND photo. 15. 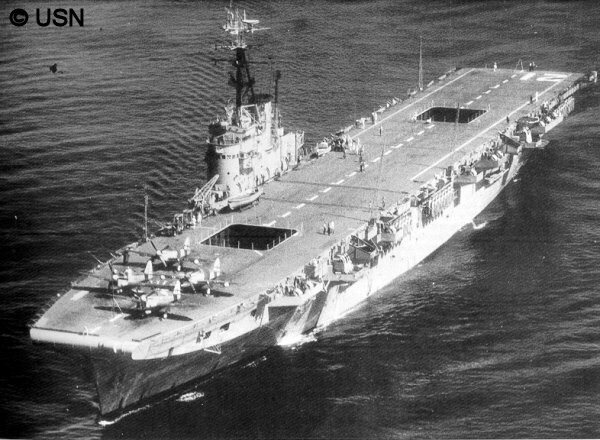 Bonnie with Trackers embarked, probably after her 1961 ASW role change, but prior to 1967. DND photo / Courtesy Corvus Publishing Group. 16. Another pre-refit photo of Bonnie. DND photo / Courtesy Corvus Publishing Group. 17. HMS POWERFUL, as she appeared when laid up after the Second World War. Courtesy of Paul Silverstone. Barrie, Ron and Macpherson, Ken. (2002). This Ships of Canada's Naval Forces 1910-2002. Vanwell Publishing Ltd. St. Catherines, Ont. Rankin-Lowe, Jeff. (2001). International Air Power Review - Carrier Aviation Issue. AirTime Publishing. Snowie, Allan J. (1987 / 1999). The Bonnie - HMCS BONAVENTURE. Boston Mills Press (1987) / Ampersand (1999). 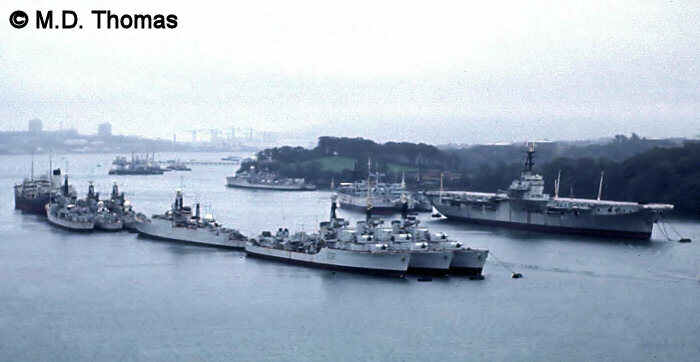 Conway's All The World's Fighting Ships, 1947-1982.